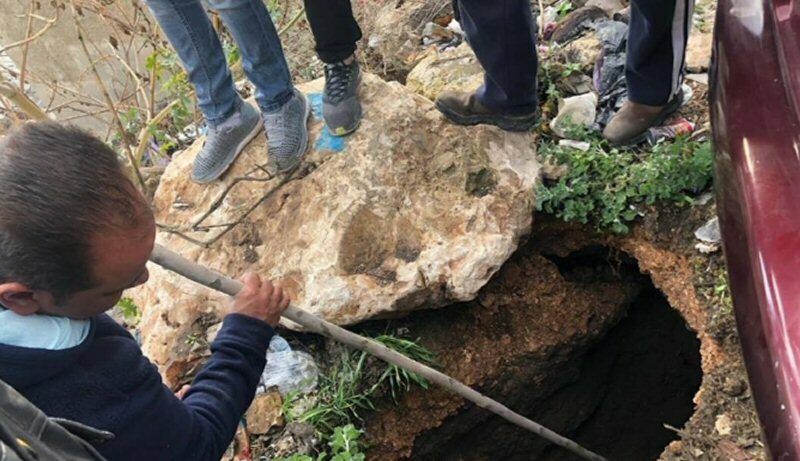 Underground excavations executed in recent months, by Israeli authorities and settler organizations in the occupied Jerusalem neighborhood of Silwan, have caused landslides in the area, as it came under heavy rain during the past few days, according to Wadi Hilweh Information Center. The Center said, according to WAFA, that a new collapse occurred in a land in the center of Wadi Hilweh quarter, in Silwan, as a result of ongoing Israeli underground excavations, a matter which poses a threat to the lives of the local Palestinian citizens. According to the Center, the underground digs by Israeli settler organizations, in that area, without any consideration for the safety of the Palestinian families living there, have posed a serious threat to the entire neighborhood. Residents of Silwan, which is adjacent to the Old City of Jerusalem, said that instead of doing something to stop the settlers’ digs and work and make living safer for the local residents, the West Jerusalem municipality decides that these homes are not safe and orders them evacuated and closed. Citizens of Silwan have expressed fear that the ongoing excavations by settlers are intentional and tolerated by the municipality and government as a prelude to evacuate the Palestinians from their homes, under the pretext they were not safe to live in to eventually take over their homes and replace them with the settlers.